Today I want to take a step back and re-introduce all of the puppies of PuppyInTraining.com. I’m not going to include the foster puppies like our GSD litter nor will I include our long or short term guide dog puppy sitting assignments like Toby, Journey, Dingo, Eko, etc. If I did this list would probably be over 100 puppies long! Today is about OUR PUPPIES all of which were service or guide dog puppies in training. Save for one…Linus (oh and Raven, but she’s making service dog puppies)! So who better to start the list then with our very own rescue pup, Linus! It’s time to meet the puppies! About: We adopted our first puppy, Linus from the Carson Animal Shelter in the Los Angeles area. The poor little guy was anemic and infested with fleas and mites. Fortunately, we got him back to health and today he is closing in on his 13 birthday! Linus likes to be the leader in the house telling the other dogs and puppies what they can and cannot do. He’s helped me train all the other guide/service dog puppies and fosters. He’s still in great shape and he is my shadow around the house. Interesting Fact: Two other names were in the running: Max and Fiver. I liked Fiver from Watership Down and I had heard when Linus was dropped off at the shelter he was with 5 of his siblings. Puppy #2: Stetson and his grenade! 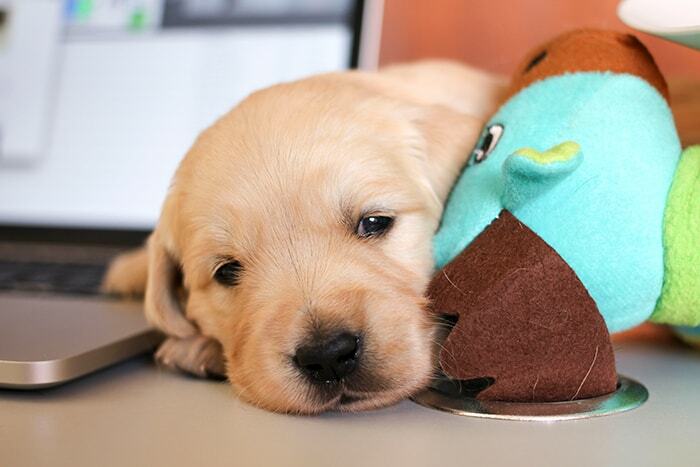 About: Stetson was our first Guide Dogs of America puppy in training. 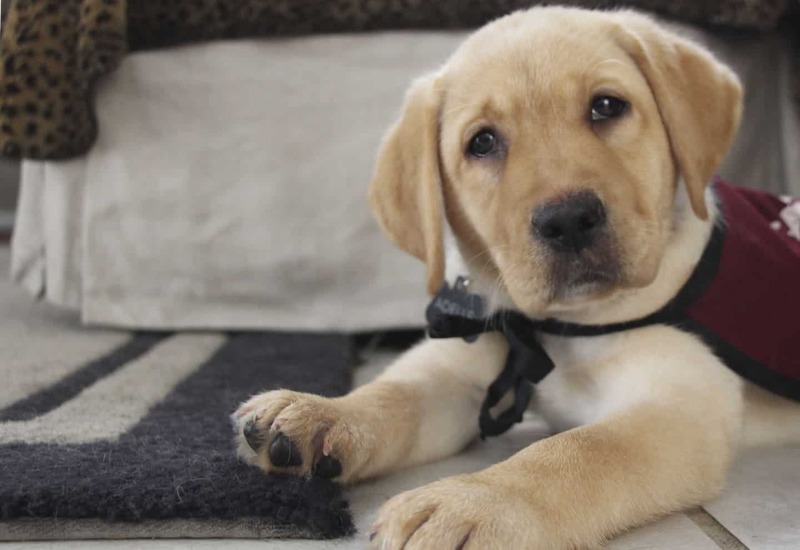 We started the blog to chronicle his journey to become a guide dog. We raised Stetson until he was 16 months old and sent him off to Guide Dog College, but after 2 months of advanced training he decided it wasn’t the life for him. Since dropping out of college Stetson moved back home and has been living the good life as a cherished family member. Stetson loves K9 Nosework training and he is my couch potato. Interesting Fact: When choosing a name for a guide dog puppy you are given a letter. All the puppy names in the litter must begin with that letter. Obviously Stetson’s letter was “S”. There are a few other rules like you can’t use the same name of a pup already in the program and the name must get approved by the school. I can’t imagine him being anything other than a Stetson. About: Derby was our second GDA puppy in training and he arrived at our house days before Stetson was career changed. In an instant we went from a house with only one dog to a house of 3 dogs! Luckily the 3 dog dynamic worked out great. Linus was the boss and kept an eye on Stetson (at the time ~18 months old) and Derby (at the time ~8 weeks old). Meanwhile Stetson and Derby were best buddies. They played well and liked to share a dog bed. Unfortunately, Derby didn’t have a serious side to him. He loved to romp and play and when it got time to be serious he would whine and whine and whine…Over time this behavior improved, but not enough before he was career changed. Interesting Fact: Derby was shaped more like a Greyhound then a Lab. Long and lean he loved to sprint, jump, and play. Derby entered the GDA adoption program and within weeks they found a wonderful family with a huge yard for him. Puppy #4: Dublin, chillin at Albertsons. About: Dublin was our first Guide Dog graduate! 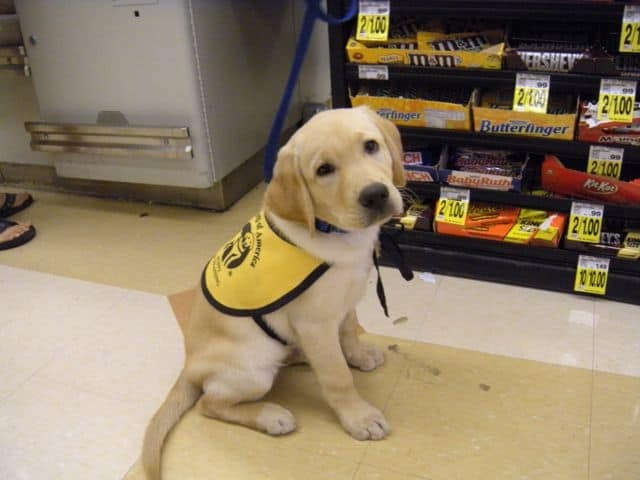 He graduated and became a working guide dog on April 22nd, 2012. That was almost 6 years from the day I started planning to raise my first Guide Dog puppy in training! April 2006 – America’s Family Pet Expo – Where I first decided I wanted to raise a Guide Dog puppy. October 2006 – Submitted my applications to Guide Dogs of America, Guide Dogs for the Blind, and Guide Dogs of the Desert. 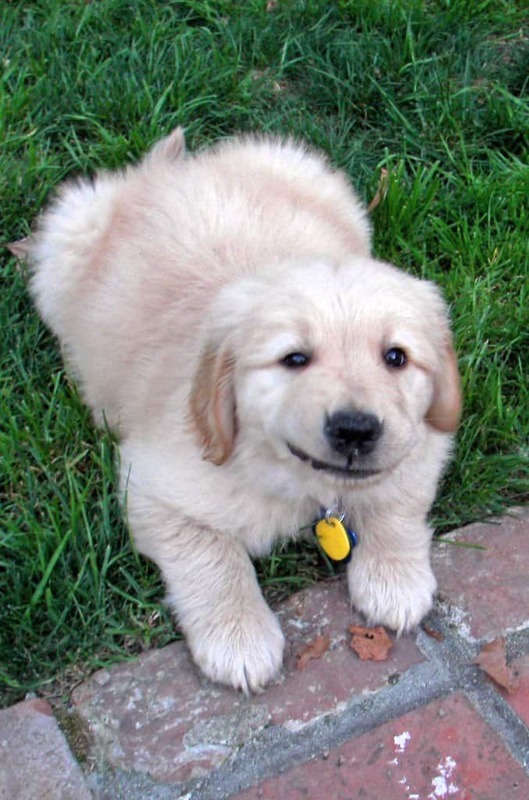 January 2007 – Interviewed to become a GDA Puppy Raiser. 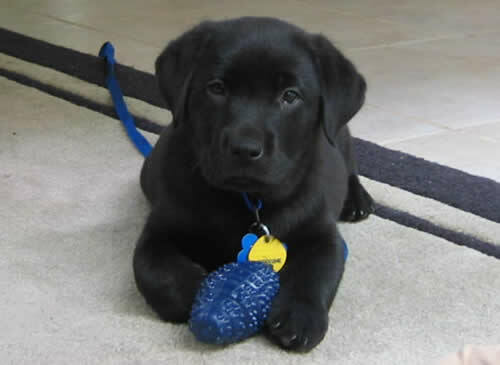 February 2007 – Brought home first GDA puppy, Stetson (career changed in 2008). June 2008 – Brought home second GDA puppy, Derby (career changed in 2009). July 2010 – Brought home third GDA puppy, Dublin. 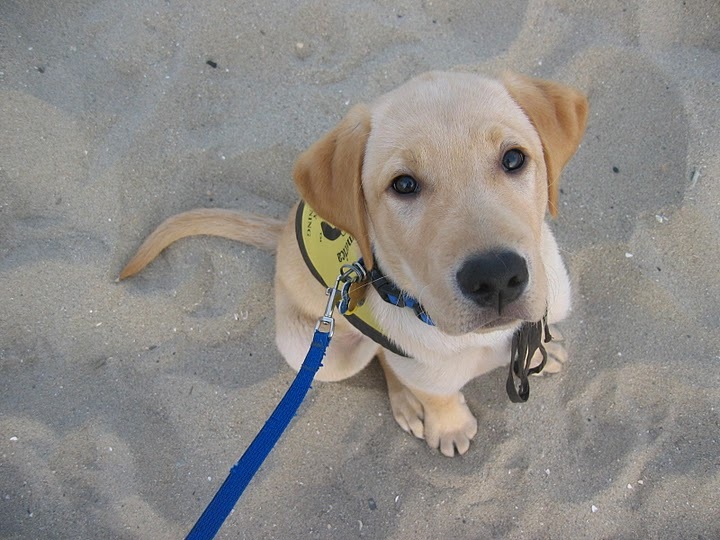 October 2011 – Dublin goes to Guide Dog College. April, 2012 – Dublin graduates with his partner Liz! Interesting Fact: Did you know we put together a video series about raising Dublin from puppy to Guide Dog called Puppy In Training TV? Click here to check out Dublin’s videos. About: Apache was a loving Golden and his M.O. was jumping up to greet people which was not becoming of a Guide Dog. He did well enough to make it all the way to Guide Dog College, but ended up career changed with a minor eye ailment. The good news for Apache was he made a lateral career move and we enrolled him in a local service dog school. After several months of at Service Dog College Apache graduated as a PTSD Service Dog with a veteran and now lives in Oklahoma. Interesting Fact: We didn’t start puppy raising Apache until he was 11 months old. His original puppy raiser was a smaller, older woman and Apache grew to large for her to handle. He was lean and over 90 pounds! I could easily see him at 110 without looking over weight. Puppy #6: Adelle, getting used to wearing my cape! About: Adelle was the first and only puppy we raised for Canine Support Teams. She was also the first puppy we raised in our new Eichler house. #1. The vents in the floor. She’d sit over the vents for hours letting the cool air blow through her fur. #2. The backyard. Adelle’s favorite game was playing chase with Linus in our spacious backyard. Interesting Fact: Adelle returned to the school early and rather than start Service Dog College I guess we can say she started Service Dog Community College. She was placed at a Juvenile Hall Facility to work with troubled kids for 8 weeks. During that time the kids worked on her training as part of their rehabilitation. After 8 weeks she came home for a short period of time and then moved on to Service Dog College at the CST Prison Pup Program. 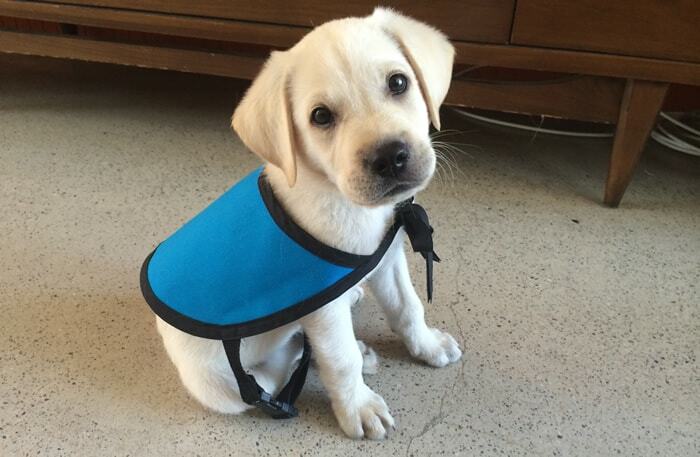 Puppy #7: Archer…it’s a cape not a vest! About: Archer was the first puppy we raised outside of a school. We got him from Trident Manor Kennels who’s owners raised puppies for Tender Loving Canine Assistance Dogs. TMK got Archer off to a great start by starting his crate training, potty training, basic obedience, and socialization. We raised Archer until he was 19 months old and then donated him to Cascade Service Dogs for placement. Archer was matched with a 4 year old girl named Aspen. She is disabled with a TBI and considered non-verbal. At their first meeting, Aspen immediately started calling Archer by name and giving verbal commands, sit, stay, come. Archer obeys her every command and is working on stopping at all curbs to prevent Aspen from going into the street. Archer’s new family is military and he’s now living in Seattle, WA. Interesting Fact: Archer was in our wedding! Ali and I got married in 2016 and Archer joined us and 200 of our friends and family members. We were lucky to have a few other puppies in training at the wedding including Porter and Higbee. About: A new era in puppy raising began for us with Raven! In 2015 (starting with Archer) we decided to branch off and raise a service dog puppy with out the support of a school. Our first objective was to find a reputable breeder and purchase a puppy. During our search we met with a breeder that asked us if we could foster one of her two breeding dogs in exchange for puppies from the litter. That is how Raven entered our lives. Interesting Fact: I always thought Golden Retrievers and Labrador Retrievers loved the water. Apparently not so. Raven is the first puppy we’ve raised that loves the water. We’ve puppy sat other puppies that love the water, but on this list of 11 pups Raven is the only one who truly loves the water. Puppy #9: Berlin, cuddling up with her first toy. 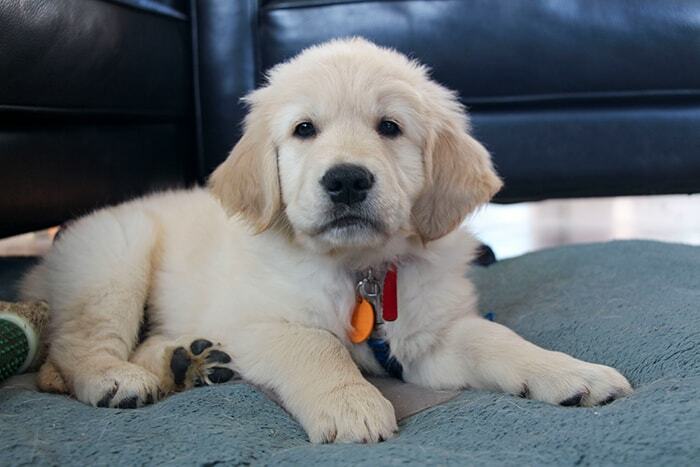 About: Smart, confident, and most energetic of the six Golden pupies, Berlin was only one of two puppies to pass the umbrella temperament test. One of our GDA friends helped raise Berlin from 8 week to 16 weeks old at which time I was hoping to identify another puppy raiser to take Berlin until she was 18 months old. Unfortunately, finding puppy raisers was much more difficult then expected. Interesting Fact: Raven’s breeder was considering one of the females from this litter as a future breeder. When we couldn’t find a puppy raiser for Berlin we offered her back and today she is under consideration as a future breeding dog. 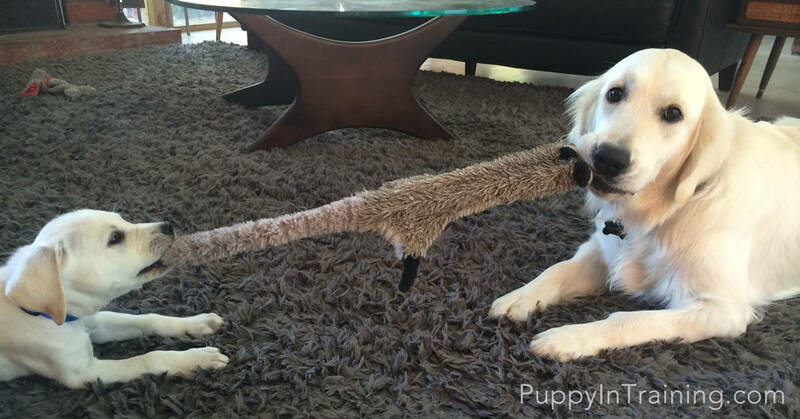 Puppy #10: Buster found his new favorite chew toy! About: Second verse same as the first. Again we had a puppy raiser for Buster for the first couple months, but because of a falling out with his puppy raisers we ended up bringing him back home. Buster showed the most promise as a potential service dog. He was the other puppy to pass the umbrella temperament test and while not as confident as Berlin he had a more even energy level. Interesting Fact: We didn’t have a puppy raiser for Buster so we contacted our friends at Tender Loving Canine Assistance Dogs and scheduled an evaluation for Buster. They put him through their own set of temperament tests and he passed with flying colors. We went ahead and signed the paperwork to donate Buster to TLCAD’s Prison Pup Program and today he’s working towards becoming a Service Dog. About: The third puppy from our litter of Golden puppies, Bear was the only one of the the three we kept who did not pass the umbrella temperament test. However, what he did do that all the other pups could not was the retrieval temperament test which shows a strong willingness to work for his partner. Bear’s biggest hurdle was building his confidence. He was a great puppy at home, but he had difficulty adjusting on our outings. We took him to grocery stores, restaurants, bookstores, and shopping malls. As I mentioned there was usually an adjustment period, but after 2-3 visits to the same place he became much more relaxed on his outings. When Bear turned 6 months old an opportunity arose for me to place him with a wonderful family. The Guide Dog school always says dogs will choose whether or not they want to work. I felt because Bear was showing difficulty adjusting in new situations he was telling me that a career change might be in order. While I wanted to give Bear a little more time to work on his confidence and see if he could make it as a service dog I also knew that finding a good match for a dog was not always an easy task. On May 21st, 2017 we career changed Bear and gave him to our friends Rosalyn and Ron. Interesting Fact: When Rosalyn and Ron adopted Bear they changed his name to Koru Bear. Did you know you can follow Koru Bear on the Golden Woofs blog and social media channels? Eleven awesome puppies in training! Currently Linus, Stetson, and Raven live with us. If you’re reading these final lines then please tell me what option you think I should choose from the above list? That was a long blog post! If you read all the way to the end then kudos to you! All of the puppies are cute! Is there a specific breed you like best? Golden Retriever, Black, Yellow, Chocolate Lab, German Shepherd, Poodle, Labradoodle, Goldendoodle? I like the Goldens and the Labs the best. The Shepherds look cute when they’re little, but are a little too yappy for me. When I think of a poodle I think of little the ones so when I see a standard poodle it doesn’t look right to me. Heard the poodle and the shepherd are super smart though! What about a Golden/Lab cross? Also, what’s your favorite color Lab? Golden/Lab would be cool! My fav color lab would be yellow, but the yellows that are super white kind of like an English cream. Although I’ve never had a chocolate lab before. 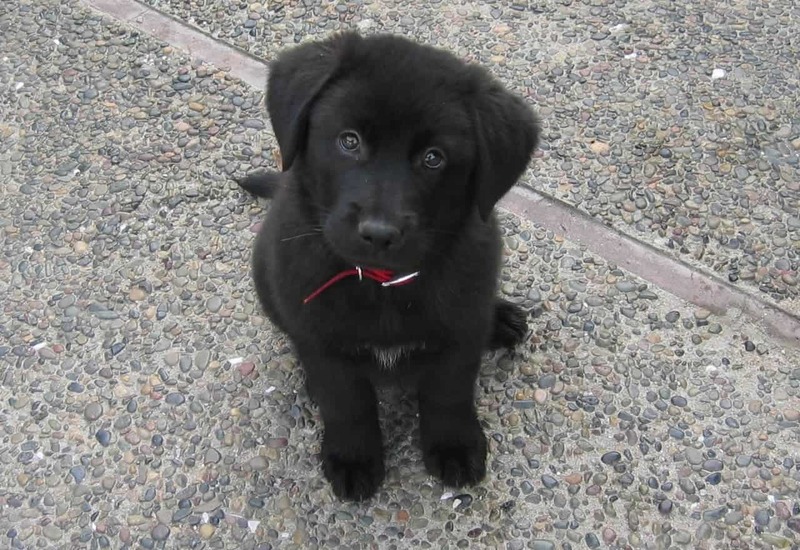 I like the black labs, but they don’t photograph well. 1. Try to match the color of your dog with the color that matches your home and interior of your car. I had a 2 black dogs first. I never noticed their fur my car because I had a black interior. However, when I got my first yellow Lab I saw fur everywhere. 2. It was much more difficult taking pictures of my black Labs vs the yellow Labs. I vote for “Raise a…?? ?” Holy pup, you’ve definitely had your hands full with all these (adorable!) pups! @Barbara, I need you to fill in the blank for me 🙂 Right now I’m leaning towards raising Raven’s litter again and hand picking one to raise as a service dog. I vote for raising a GDA puppy. They have such a great program. We love Guide Dogs of America! Apache was our last GDA puppy, but we’ve puppy sat countless puppies since then. A couple weeks ago we had 13 week old GDA puppy in training, Eko for 3 weeks and a few weeks before that we had 9 week old puppy in training, Dingo for 2 weeks. It’s definitely something we’re still considering. Have you raised GDA puppies? Good grief! You have given me a severe case of puppy fever! 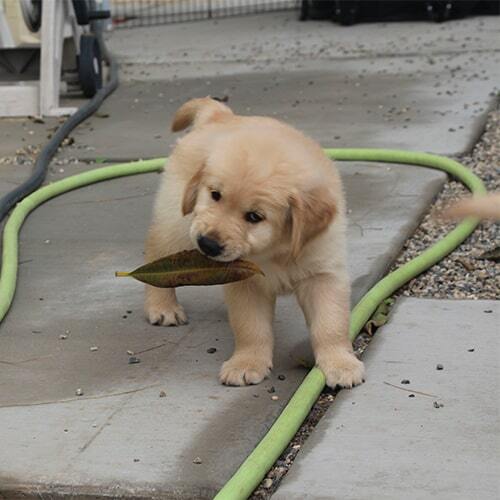 Golden Retrievers and Labs are such adorable puppies. Thanks for training service dogs. What an awesome thing to do for people. We love our Labs and Goldens and of course Linus, our Australian Shepherd mix. Raising guide and service dog puppies has been life changing not just for the people who receive the dogs, but for puppy raisers as well. It’s incredible to see how these dogs help their new partners regain their independence. After over 10 years I guess that’s why I continue to raise and train service dogs. I didn’t realize Bear ended up with Rosalyn! What a perfect fit. Looks like he’s doing really well. Yep, Bear has become quite the traveler with Rosalyn. They visited my alma mater this past weekend in Tucson. I love being able to watch his adventures on social media and the Golden Woofs blog. We’re very happy that Koru Bear has such a wonderful home. I’m always excited to see what he’s up to next and we follow your social media channels and blog religiously to catch the latest updates. Thank you for doing all you do and for making Koru Bear’s life special. I’m sure we’ll see you all again soon.